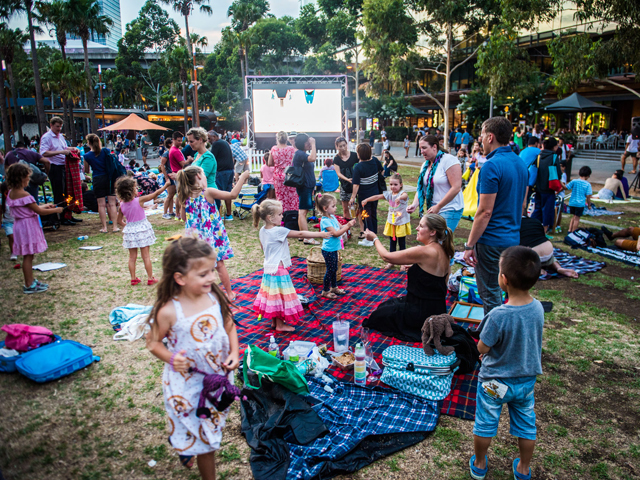 Swooping in for another 17 fun-filled nights of outdoor cinematic splendour this January, Night Owls Kids' Film Festival is Sydney's most anticipated annual family-friendly summer event, screening a bumper program of FREE box office hits. Since 2012, Night Owls has delivered magical nights on Darling Quarter's Village Green for adults and children alike – surrounded by nature, in the glow of the silver screen and under the spectacular city night sky, there truly is nothing else like it. From Friday 4 to Sunday 20 January 2019, fun-loving film fanatics can zoom in on a wave of happiness and land the perfect perch from which to explore one of Australia's best children's playgrounds and grab an easy dinner from one of the many renowned eateries in the precinct. Each night from 6pm there'll be live entertainment, followed at 6:30pm by local and international short films curated in collaboration with Little Big Shots, Australia's major children's short film festival. The main event kicks off at 6:45pm, with the coolest outdoor summer feature films for all the family. From the spectacular The Greatest Showman (just try to resist singing along!) and A Wrinkle In Time; to Pixar's newest tearjerker, Coco; and crowd pleasers Paddington 2, The Lego Ninjago Movie, Peter Rabbit, or Jumanji: Welcome to the Jungle - there's something to entice both young and old. Night Owls also has the summer blockbusters for the grown-ups covered, with After-Hours screenings on Fridays, Saturdays and Sundays from 8:30pm, including Star Wars: The Last Jedi, Thor: Ragnarok, Ready Player One, Ocean's 8, Pitch Perfect 3, The Big Sick, and the hugely successful superhero hit and box office smash, Black Panther. "Darling Quarter is thrilled to be hosting another season of Night Owls, cementing it as a cherished summer experience that brings the Sydney community together. It's lovely to see friends and family meeting up with their picnic rugs and a sense of excitement, ready to share relaxed evenings under the stars and get a glimpse into other worlds through the charm of cinema" said Retail Manager for Darling Quarter Kathryn Salmon. If you forget to pack snacks or simply want a night off from cooking, there are plenty of delectable dining options at Darling Quarter, so take your pick from sushi (Umi Sushi & Udon), steak (Stacks Taverna and Bar), Thai (Nok Nok Thai Eating House), Brazilian BBQ (Braza Churrascaria), fish & chips (Taste), pizza (Vesta), or burgers (McDonalds) and wrap it all up with gelato (Gelatissimo) or chocolate treats (Guylian) for dessert. To close out the remarkable summer season of world-class entertainment, Night Owls is proud to present Sweet Country as the closing night film. It's a stunning Australian period Western with an all-star cast starring Sam Neill, Bryan Brown and Matt Day. The film's screening is particularly fitting, with Darling Quarter previously hosting a popular public art initiative, Sweet Country Stills Exhibition, featuring large-scale behind-the-scenes and portrait stills photographs, shot by acclaimed Australian photographers on the set of the movie.